Read about - Katherine Gorge - Nitmiluk Tours below. We had been on a cruise in Katherine Gorge years ago when our children were younger but decided to go again and see if the experience would be different. I am so pleased we took the Cultural Cruise in Nitmiluk (Katherine) Gorge. This cruise is approximately two hours and was conducted by two aboriginal men who were great fun and extremely knowledgeable about the local area, the gorge, the plants, animals and history of the indigenous people of the area. You will see amazing rock art - so high on the rock face that you will wonder how it got there. The group was divided into two separate boats to travel in the second gorge - some parts can be very shallow. We saw two freshwater crocodiles, nesting areas, edible plants and a salt-water crocodile trap. The area is monitored for several weeks after the wet to make sure there are no salt-water crocs around. If any are found they are caught and then transferred to a crocodile farm in Darwin. We learnt about the significance of Kapok tree - when the yellow flower appears the Aboriginals know the freshwater crocodiles are ready to nest. When the green pod opens (inside looks like cotton) they know the crocodile eggs are ready to hatch. During the cruise our guides explained the cultural significance of the first two gorges to the traditional landowners - the Jawoyn people. It is absolutely fascinating how the Aboriginal people understood the land and the seasons to find various sources of food. You will need to walk between gorges and are asked to wear appropriate footwear, wear a hat, sunscreen, protective clothing and insect repellent. It can be very hot in the Gorge and these tour are subject to weather and river conditions. 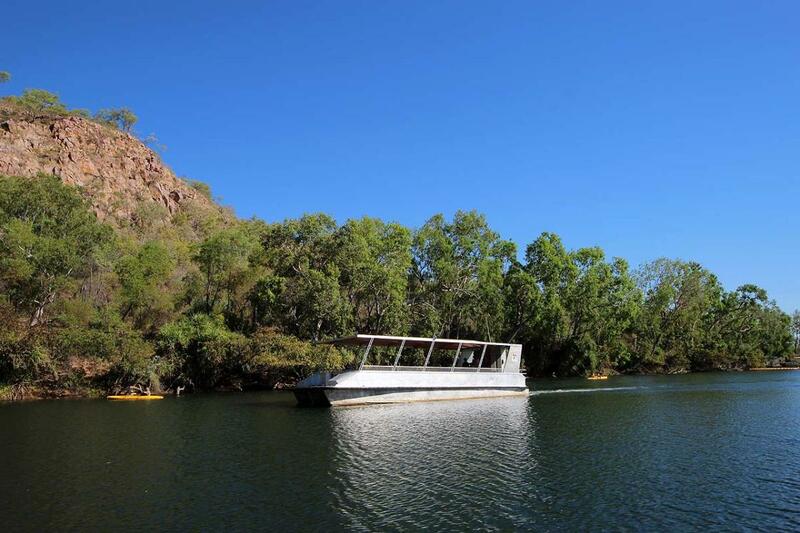 Nitmiluk (Katherine) Gorge is a beautiful place to visit and I strongly recommend taking one of these cruises. have you been to Katherine Gorge - Nitmiluk Tours? Explore Katherine Gorge - Nitmiluk Tours with RvTrips and find out where to stay, what to do and what to see. Helping caravan, motorhome and camper owners have a great holiday.